Are you going to the Centurion Party next Saturday night? Our delivery truck features the Centurions of St. Mary's Hospital's annual fundraising party event poster, with team members Javier and Fernando standing by. Thank you for your loyal support, Centurions of St. Mary's Hospital! We have a delivery truck making the rounds of the Tucson community every weekday. Why not use it to provide added exposure and promote events or groups of importance to our loyal customers by using it as a mobile billboard? Remember to show your customers just how special they are with some appreciation marketing. 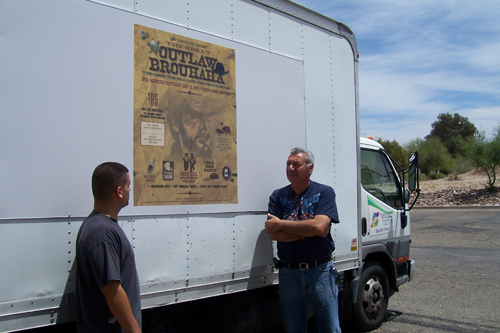 Some sort of advertising value like these posters on our delivery trucks is one exceptional way to do it. Stop by their office and let them know how much you appreciate them with a custom printed PACKAGE / SPECIALTY BOX with candy and a handwritten thank you note. Perhaps you've been working with a customer year after year, even your first year - there's always an anniversary to celebrate based on what month you started working with them in. If you're a B2B company, celebrate their business anniversary based on when they started. So, what can you do for your loyal customers to add value for them? Chances are, they'll appreciate you, too. To discover more about EVENT MATERIALS like posters or signs with large format printing for your next event, CONTACT US or call: (520) 571-1114. Consider the Possibilities.